This 2-day program is tailored for the cruise ship passenger who wants to see much of what St. Petersburg has to offer on a relaxed tour at an attractive price. Starting at the port your tour takes a route that orients first time visitors to the general relationship between the natural features of the Neva River delta and the city's different districts. Visits include Labor Square, Mariinsky Theater(of such world famous ballet dancers like Vaslav Nijinski, Rudolf Nurejev, Mikhail Barishnikov), the St Petersburg Conservatory, Monuments to famous Russian composers Glinka and Rimsky-Korsakov, St. Nicholas Cathedral, including a photo stop, Grand Choral Synagogue with a photo stop, the Neva and Moika Rivers, Yusupov Palace, St Isaac Square with photo stop, restroom stop at Pushkin souvenir store prior to departing on a 60 minute ride to Peterhof. On the way to Peterhof, you will pass through residential suburban districts. Hydrofoil high speed cruise to Peterhof - you will be traveling to the southern palace estate Peterhof by the comfortable and fast hydrofoil, that offers a relaxing view of the Neva River, and Gulf of Finland. Peterhof Fountains & Grounds – You will be exceptionally lucky since our tour enters the estate through the unbelievable Upper Park, which is very seldom visited. Peter the Great drafted the layout for the 300-hundred acre park and supervised the design of the palace fountains. The Grand Cascade, the most famous fountain group, features gilded Samson prying open lion's jaws as water cascades down the terraced steps, and small spouting fountains anoint smaller sculptures. We shall stroll through the lower parks and gardens, and view and “experience” some of the Peters surprise creations among the many decorative fountains. Just think all of these fountains are operated with no pumps. – No inside visit, only the fountain parks and gardens. The first day lunch will be a three course quality meal at the Samson, Romeo or Marriott Hotel. Metro (the city’s underground subway system) - On our return to the city we'll Visit the magnificent "palaces of the People" as the St. Petersburg Metro used to be called during the Soviet Union years. The construction was started after the II World War, and its expansion continues endlessly, new stations opening periodically. Since the entire St. Petersburg was built on marsh land, the tunnels had to be dug deep, deep until solid soil was found, and you shall descend to the platforms using fast efficient escalators. All the stations are unique in design and theme. Some are luxurious with art work, statues, sculptures, mosaic walls, and chandeliers, some are simpler looking. You will see several stations on your trip north to the city center where you will emerge in Vladimiskaya Square - A ride and viewing of some picturesque stations is included. Driving along the city's and Russia's most famous street, Nevsky Prospect you will arrive at Art's Square and will include walking along Nevsky Prospect, visiting the beautiful Armenian Church, inside visit to the restored historic shopping center Passage, walk along Italian Street and the Griboedova Canal with photo opportunities of the unique architecture of the Singer Building and the Church on Spilled Blood, Russian Museum, the monument to Pushkin in Arts Square, the Philharmonic Hall, Grand Hotel Europe, and lovely park. Return to your ship by 5:30p.m. On day two we will explore the town a little further starting on the University Embankment, visiting the Spit of Basil Island for one of the most spectacular vistas for photos in the city, Kronverk, Peter and Paul Fortress, log cabin of Peter the Great, Souvenir store "Basar", Trinity Bridge, Field of Mars, photo stop at the stunning Church on Spilled Blood, open air Souvenir Fair, Palace Embankment, Admiralty Embankment, stop at St Isaac Cathedral, walk from St Isaac Cathedral to the Admiralty Pier through Alexander Park and the well known monument to the Bronze Horseman on Decembrists' Square and walk pass the Russian Supreme Court. Lunch at the Samson, Romeo or Marriott Hotel. Hermitage - We will spend the rest of the at the Hermitage Museum. The former residential palace of the Romanov rulers, called the Winter Palace, and four other buildings together house today one of the world's most prestigious museums, The Hermitage and one of the premier art collections. Your guided tour includes both the Winter Palace and the Hermitage display rooms, which contain over three million art works, including paintings by Da Vinci, Rafael, Monet, Rembrandt, Renoir, Picasso, Van Gogh - to name a few. 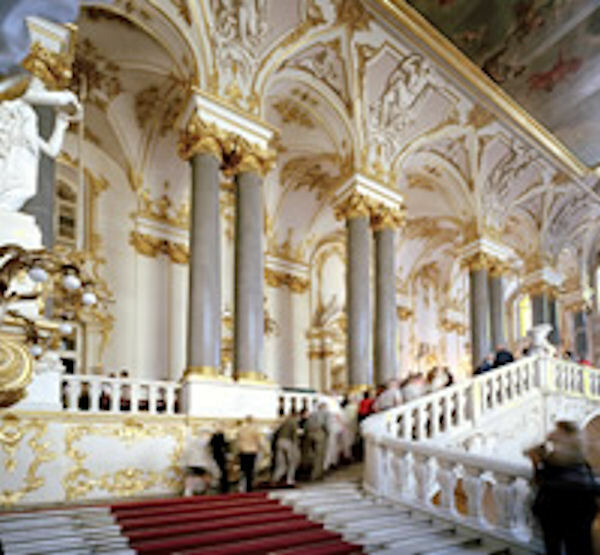 The Winter Palace was designed by Italian architect Rastrelli, and boasts huge ceremonial reception rooms, throne rooms, private theatre, gold and marble, irreplaceable state gifts and collections, patterned parquet floors, ornate staircases, molded and decorated ceilings, and gilded appointments. If nothing else, this is the “must” place in St. Petersburg. – An inside visit. Browse for Russian souvenirs and gifts and bargain with local vendors at the various stops during your excursion. Your tour includes one official stop at one of St. Petersburg's quality souvenir shops where you can barter for such traditional Russian goods as lacquered boxes, jewelry, pins, hand painted nesting dolls, usually called “Matryoshka Dolls”, handicrafts, china and porcelain, Russian delicacies like Caviar, military memorabilia of the Soviet Union, beautiful coffee table books about Russian topics, and many others. As a valued guest of DenRus you will get a free gift and a 10% discount coupon. Please Note: Minimum age to participate in this tour is 12 years of age. Remember to bring your camera. Minimum age to participate in this tour is 12 years old. This tour has intensive, extended distances to walk and many steps. You do not need a separate Russian visa to take this tour from your ship. Our tour operator is authorized by the Russian Ministry of Foreign Affairs to arrange services for cruise passengers who do not have Russian visas. In order to guarantee visa-free participation in this tour, we need to receive a Tour Authorization Certificate for you and each person in your traveling party. We must request this Tour Authorization Certificate from our operator no later than two (2) weeks prior to your sail date. After we receive your excursion order, you will receive an email from Shore Excursions by PortPromotions.com asking for your passport and other information. You must provide us with your passport and other information at least two (2) weeks prior to your sail date or we may not have time to receive your Tour Authorization Certificate. Please respond promptly to this request. We will email you your excursion tour voucher for your traveling party, and one tour authorization certificate for each member of your traveling party. It will be your responsibility to print and carry with you 1) the tour voucher, 2) the Tour Authorization Certificate, one for each person traveling with you, and 3) a valid passport for each person in your party. These documents will be required to participate in your St. Petersburg excursion. Failure to have these documents to present to Russian immigration officials and your excursion leader may result in you not being allowed off the ship in St. Petersburg, and may not entitle you to a refund. Please refer to the full terms and conditions listed on our website. On the first day the tour’s return time back to the ship is about 5:30 PM (17:30). Thus is sufficient time to have a dinner and to prepare for the later Russian Folkloric Show or Classical Ballet performance. On the day of your departure the tour returns to the port one hour prior to your ship’s scheduled departure time.